This is a story of experiencing a special day in God’s love — feeling God’s loving care, seeing special things and more. On this day, 47 years ago, my family emigrated from Europe to Australia and arrived in Melbourne. Almost on the same day, January 6, eight years ago, I returned back for good after many years of living and working in USA, Czech Republic, and Asia. That was the beginning of the writing/publishing chapter of my life, this time in the Brisbane area, in the proximity of my widowed father. Since my life seems to have run in roughly 8-year cycles, I wonder what the coming year will bring. This morning, a close friend, unaware of the above anniversaries, was inspired to pray that today my husband and I will have an exceptionally close bond with our Heavenly Father and feel the Love and Peace that emanates from Him. This story, written at the end of the day, shows how his heartfelt prayer for us to feel God’s love in a special way was answered. Today is Thursday, the day we generally spend with my now 92-year-old dad, who still lives on his own about two miles from us. 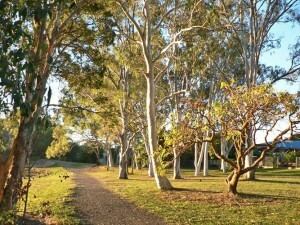 The morning was cool so I decided to take a walk to the nearby park. As I left through the back door, I noticed a butterfly sitting on the wall close to the door – a little unusual occurrence. I walked around the park, as usual enjoying the two ponds with their bird life, the trees and the changing sky, even getting caught in a drizzle for a short while. Nature always gives me a feeling of closeness to God – I never get tired of spending time in creation. In fact, it was through my love of and interest in nature from an early age that God called me to conversion in my latter teen years. Returning, I walked around the block back to our street. 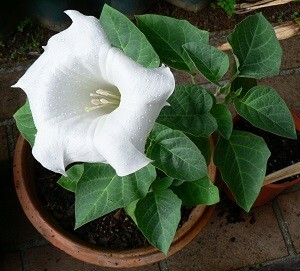 About 100 yards from home, I noticed in the cement crack between the road and a pavement that a Datura (Angel’s trumpet) had sprung up. About a foot tall, it had a single white flower, open in its full beauty and sprinkled with droplets from the recent drizzle. I had already seen the plant yesterday, when it was still in bud. Having had a similar plant in a pot when I was growing up in Czechoslovakia many years ago, I thought it would be nice to take it home and replant it. In fact, I marvelled how it was able to grow to this size and even bloom with such minimal amount of soil. I had tried to gently pull it out but without success. Not wanting to break it, I gave up the effort. Today, the flower’s beauty as it glistened in the morning sun ca ptivated me anew. Having read fascinating research that plants may be as conscious and sensitive as animals and, incredibly, can even discern hostile human thoughts, I communicated to the plant loving energy and my desire to take it home. Then I again attempted to dislodge it from the narrow crack in the cement. The rain we had yesterday may have helped in this, and today the plant came out effortlessly, roots and all. Being only a couple of minutes from home and having a pot with soil ready, I was able to replant it with minimal delay. I shared my blessing with my husband, Alex, who took a photo of the plant before it began to wilt in its transition and adjustment to its new home. 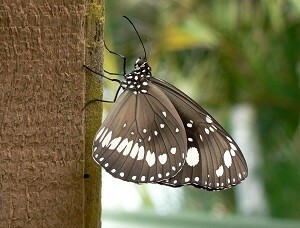 The butterfly that had sat at the back door was now fluttering around one of the trees at eye level. Then it sat on a wooden beam in our alfresco area. My husband, still with camera in hand, was able to take several photos of it. It then flew around the garden with Alex following it and trying to photograph it in other places and positions. It would distance itself and come back again and again. It reminded me of a story author Wayne Dyer told of how a butterfly seemingly befriended him and stayed seated on his finger for a c onsiderable length of time. This one in our garden didn’t get quite as friendly as that, but it looked like it wanted to play a game of “chase me” for a while till it flew over the fence one last time and disappeared from view. Another little blessing that brought a smile to our faces. Before long, my father arrived and we left for a walk to be followed by a lunch at a Golf Club restaurant. On the weekend, Alex and I had discovered a previously unexplored street about 10 minutes by car from our home which led into a newly constructed path through the bush (Australian forest). We had followed it for quite a while then, but didn’t get to see two turn-offs from the main road. So we decided to explore those today. Both led us to inspiring nature vistas – one in a mangrove area, the other by a river. Again, awed by the beauty of our surroundings and the blue sky overhead, we felt our Father’s presence and blessing. fountain and flowers in the foreground – a peaceful and inspiring scene to enjoy our meal with. After lunch, we stopped at the sho ps before returning to our place for coffee and dessert. 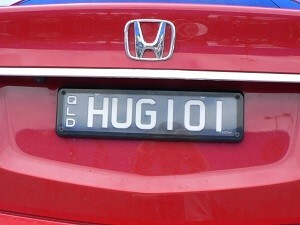 Walking through the car park, my eye fell on a number plate that read “HUG101”. It once again brought a smile to our faces, and Alex took a picture of it. Alex and I had several heart-to-heart talks today and last night, musing among other things how so many fulfilled needs and blessings come to us by grace and in God’s timing. Sometimes we can strive and struggle to get what we want, experiencing much stress and little success, when a few months or a year or two later, at the right and best time, God fulfils our desires in a far superior way than we had ever dreamt. In this context, I would like to end this story with the Apostle Paul’s prayer in Ephesians 3:16-20.